With the help of the Internet, how an individual feels when interacting with your website is important and that is called user experience (UX). If you make people feel positive with your website, then undoubtedly you will enjoy an increased customer loyalty. Customer loyalty and how visitors feel on your website are truly important to accelerate the business journey and growth. With the increasing use of Smartphones and devices, users search for information, product and services online than visiting a library or a brick-and-mortar shop. Hence, the availability of correct information across different platforms and screen sizes has become critical for businesses to connect with their audience and marketplace. To make information available to readers in a format of their choice, responsive web design is the mantra! Responsive web design approach aims at creating sites that provide easy reading and navigation, with minimum panning, scrolling and resizing across different screen sizes. Thus, for rendering a higher user satisfaction, businesses are now aggressively using the responsive design tool. Since every entrepreneur is availing responsive web design tool then what more can you do to attract customers? 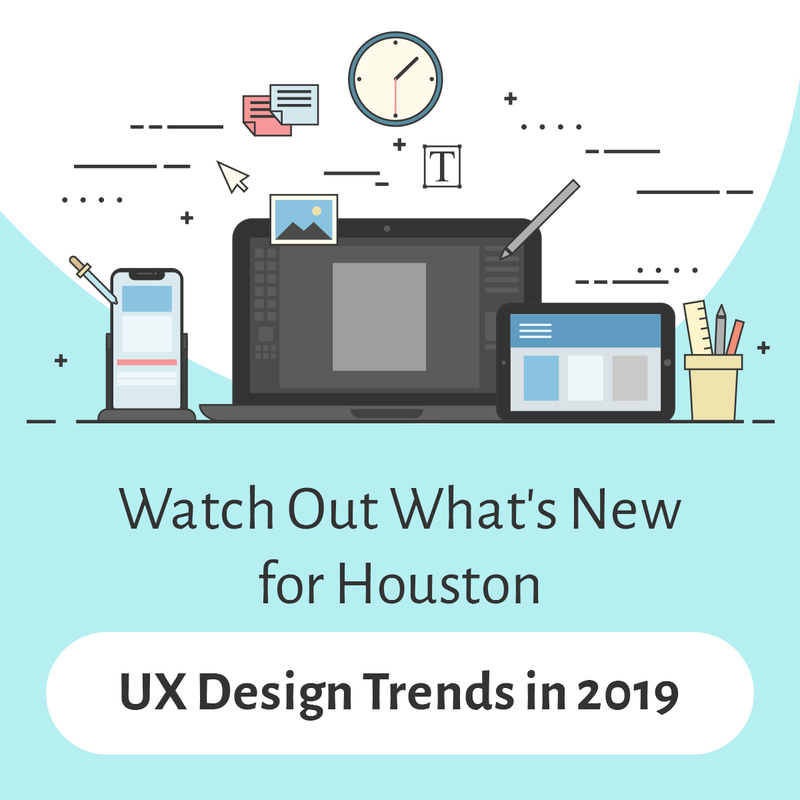 Here the only solution is crafting the right strategy by analyzing the latest and upcoming Houston UX design trends in 2019 and applying them for offering better UX to your visitors and customers. The practice of using voice command is aggressively increasing. In other words, using voice command is changing the way we used to live. Industry reports predict voice command technology will see tremendous growth in the next five years and will be worth the US $18 billion industry. Thus, the any-sized company seeking to expand and grow should accept voice activation capability as an important part of their design and business strategy. When it comes to UX design in Houston then it can be said that the role of the designers will go beyond the screen. In the future, UX designers will be there to design the right solutions which will easily anticipate a user’s imminent move or query. When a query is quickly and correctly answered it will lead to greater user satisfaction and higher customer engagement. Generally, a UX designer’s role is to ensure a high-quality user experience that means interruptions free user experience, regardless of the device in use. ‘Mobile first’ will lead user experience in the coming days. Hence, designers are encouraged to create more active multi-device experiences for an actively growing smart devices user base. It will only add to your advantage if you go a step deeper and craft smarter digital experience that goes beyond PC and smartphones. The world is tending towards 3D technology. And that is a form of material design. When it comes to flat design then it is 2D animation with a minimalistic feel. But the 3D design has more depth with the icons, shading and other light features. No doubt flat design has sound benefits, but the material design will lead you towards greater success by bringing innovative design into 3D. And it will instantly improve the interactivity and adaptability. People will feel more secure with your application. It is the best way to win the trust of the customers and trust is truly important if you are a new player in the genre. When the web world is changing at a fast pace then a UX designer’s role is not limited to only understanding a user’s customer journey with the company’s online presence. If people are not aware of your existence, then there is no benefit acting exceptional. But in 2019, you can inform your targeted audience about your brand, product or services in a smarter manner. People will search for empathy, psychological connection, motivations, and inspirations in your story and that you need to obtain in the UX design for deeply enriching a customer’s user experience. Your storytelling needs to be smarter. On an average, your audience receives 10 solicitation messages daily, and that is mentally and emotionally draining for them. Sending them solicitation messages regularly will thus negate your marketing efforts. You need to do something attractive that easily grabs their attention in the first glance. You can craft live video; it is a great way to achieve the desired traffic. In the videos, you can host promotional advertisements for your existing or new product launches. By using AR and VR technology, you can stand tall in the crowd. With these upcoming UX design trends, you can turn the wave of brand awareness and popularity in your favour in 2019. Want to know more? Discuss with an expert on UX design in Houston.